I was pleasantly surprised, therefore, to learn that there’s a whole city (as opposed to half a city?) named “Shiner” in Texas. Plus, there’s an award-winning beer company situated in Shiner, Texas, called Shiner Beers, which makes its beer in Spoetzl Brewery, located right in Shiner. So now, besides for that very hideous bruise surrounding one’s recently punched-out eye, my last name is also a city and a beverage. I’m feeling slightly more illustrious. 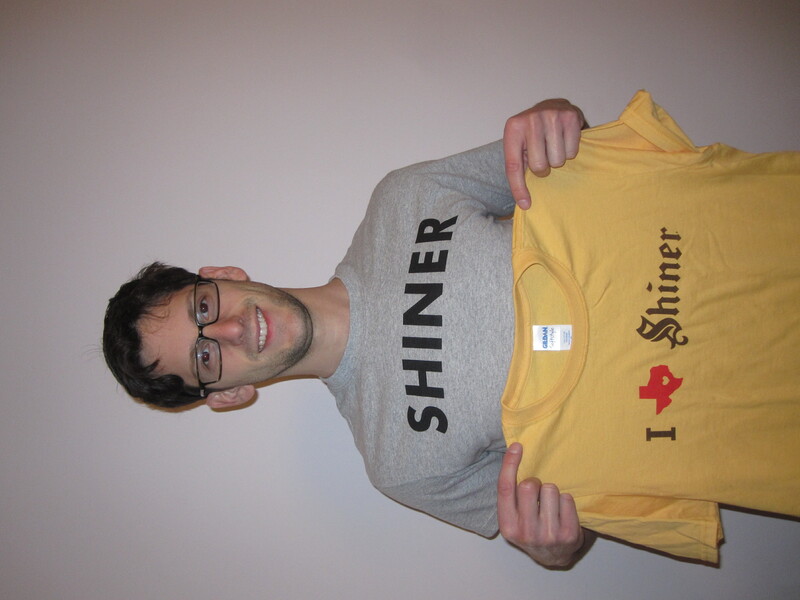 My brother, Jacob, contacted Shiner Beers and offered to be their East Coast spokesperson. They replied with a very warm email and sent him some free t-shirts. So there he is, spokesperson-ing. Don’t it look good? Have you ever found your name out there in the world? Alas, no. Just the t-shirts – but they’re nice t-shirts, aren’t they?